Francesca and her daughter Kara from Francesca’s Bridal in Lutherville MD with Elen. Friends and customers for 20 years. Always appreciated. Angie and Elen pose with dear friend Nicole from The Magnolia Bride in Kennersville NC. 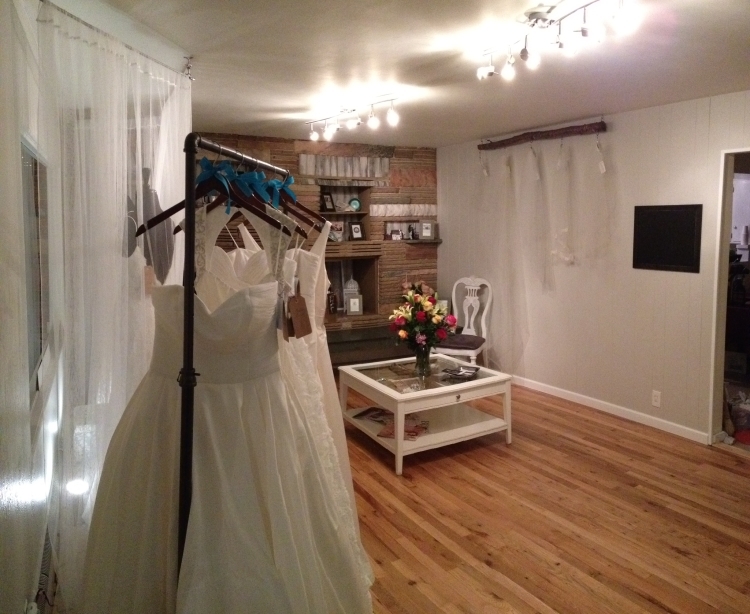 Nicole used to be a neighbour in Essex VT and has taken her bridal expertise to a warmer location. No - there was no rain. The umbrella’s were just there so people knew where to check in. We’re ready to greet you! It’s rare we find the time to add some memories to this page, but here are some of the people and styles that helped make the September Chicago Market a memorable one. From Piera’s Bridal in Shelby Township Michigan we have Piera on the left and Katrina (right) posing with Elen. Always a pleasure to see them in Chicago. Angie and Elen worked hard to set up their gorgeous showroom. 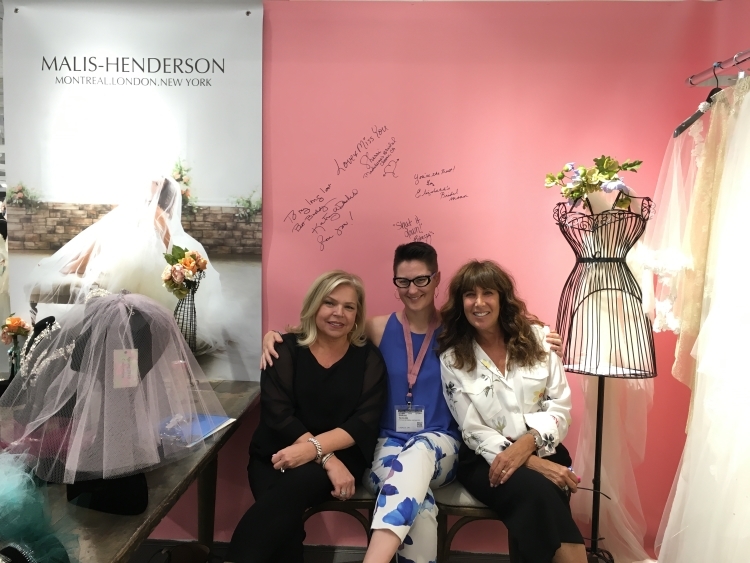 From Birmingham Michigan, Elen and Angie greet Lorenza (center) from One In A Million Bridal . Always a joy to see fellow Canadians in Chicago! Karyn (l) and Christa (r) came all the way from Chester & Felicity in Halifax Nova Scotia. Sherri from Madeline’s Bridal in Clovis California poses with Elen and two beautiful models who came by from Bonny Bridal to try on some headpieces and jewellery. Chicago’s a wrap! See you in New York! 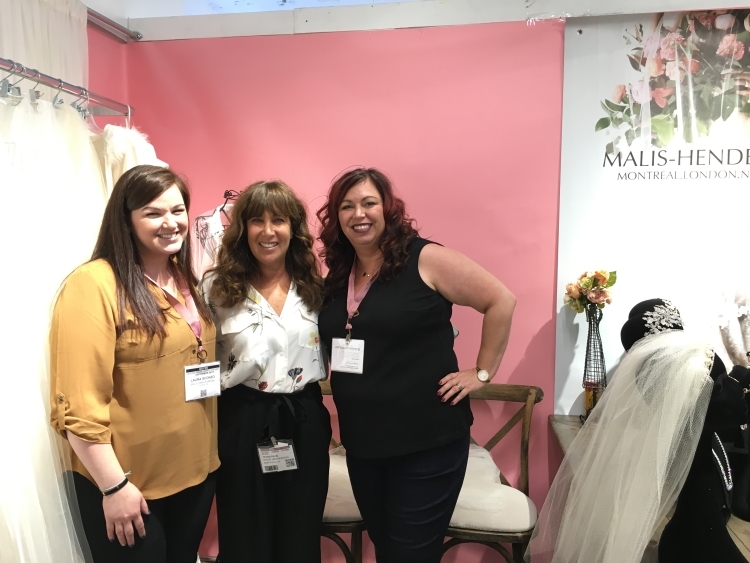 Angie (L) and Vela (R) from Malis-Henderson pose with Kristiane from The Bridal Centre in Calgary. We are always thrilled to have our dear friend Kristiane model one of our new headpieces and create a fun day at market. Here are some photos of the Malis-Henderson exhibit and the crowd from last night. Elen with some bubbly in front of the DEBI Veil. Four fabulous headpieces from previous seasons designed by Elen. Elen with Caroline Thérien who looks after Education and Research for the Montreal Fashion Museum. Miriam Henderson (can you believe she's 92! ), whose husband Dan founded Malis-Henderson poses in front of the headpiece and veil she wore at her wedding in 1946. 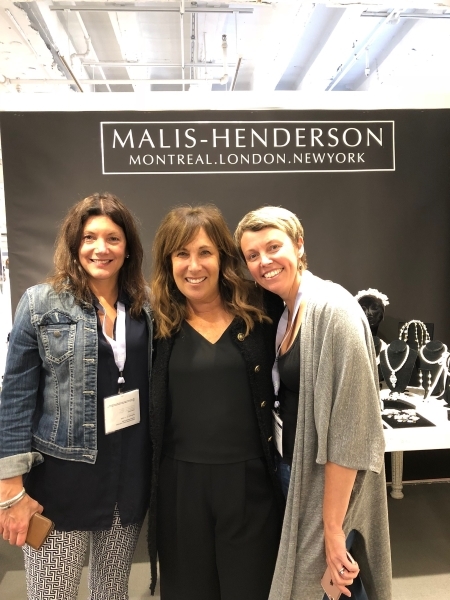 MALIS-HENDERSON is proud to have been chosen to display seven veils and headpieces in the bridal section of the Montreal Museum of Fashion. The museum, located in the Old Port District of Old Montreal, collects, preserves, and displays fashion originating in Quebec and dating from 1845 to the present. Research, conservation, education, dissemination: these are the cornerstones of the Fashion Museum’s activities. The Fashion Museum is thoroughly modern and future-focused, and an indispensable resource in the world of Quebec fashion and textiles. Its original, cutting-edge exhibitions attract connoisseurs and neophytes alike. at 363 de la Commune Street East, Montreal. It may be the launch of the 2017 Fall Collection, but flowers are everywhere this Spring. Headpieces, and bouquets made from "Tru-Touch" Flowers, Silk-screened Garden Veils, and Sequin floral patterns on veils are a big hit with the retailers. We've recovered from the travel, set up and show and have found some time to post some happy memories with customers who took the time from their busy schedules to come and visit our booth. To reach the customer web site, click on the picture. 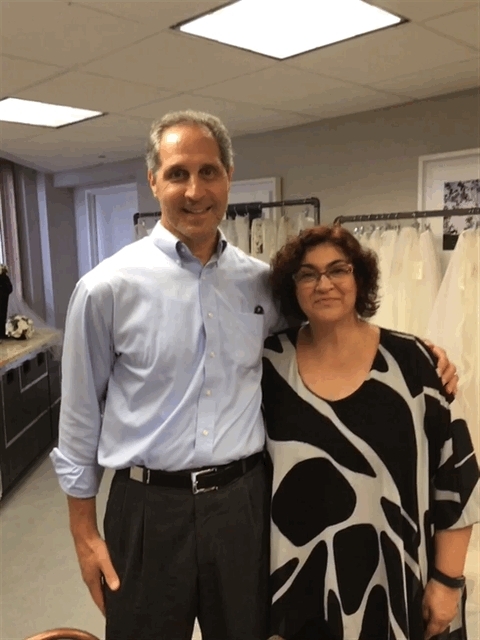 It's always nice to see fellow Canadians like Patricia from Pearl Bridal House who came to Chicago from Port Credit ON. Suzi (in white) and staff of Weddings 826 in Chicago share some bubbly while visiting. Julie (L) and staff of Mira Couture of Chicago gave us a home-town welcome. Sarah (L) from It's Your Day Bridal in Windsor ON never misses a visit to Chicago to see Elen and Vela. Jill of Pierra's Bridal in Shelby Township MI shares hugs with Elen and Angie. It's always a joy to see Janice (in white) from Adore Bridal & Specialty from Morton IL. Stacey (just behind always smiling Vela (R)) and staff from Bridal Elegance of Torrance CA. Jaehee (L) of Jaehee Bridal in Englewood NJ with model Tanya. Thank you to the National Bridal Market who provided the Saint Patrick's Day good luck in the form of a real-live Leprechaun seen here with Tanya our model. Cate from Little White Dress in Denver CO is standing between Elen (R) and Angie. 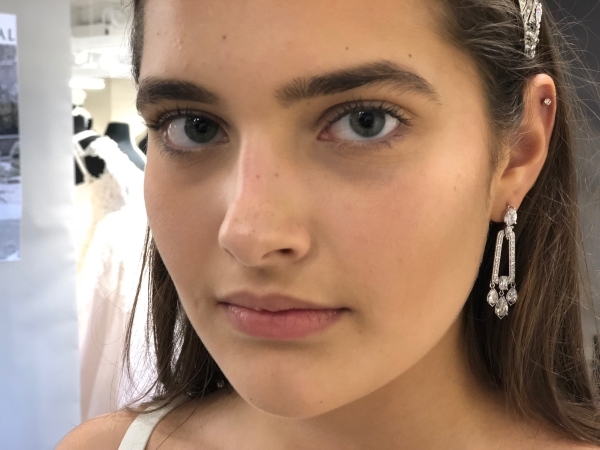 Just in, here is the video from the New York International Bridal Week fashion show, featuring three outstanding bridal fashions by Elen Henderson. Ian Stuart of bridal gown fame, all the way from the UK, poses with Elen and two of his models in his booth at the New York International Bridal Week. Here, one of his models is wearing Elen's latest Garden Party Bridal Hat. 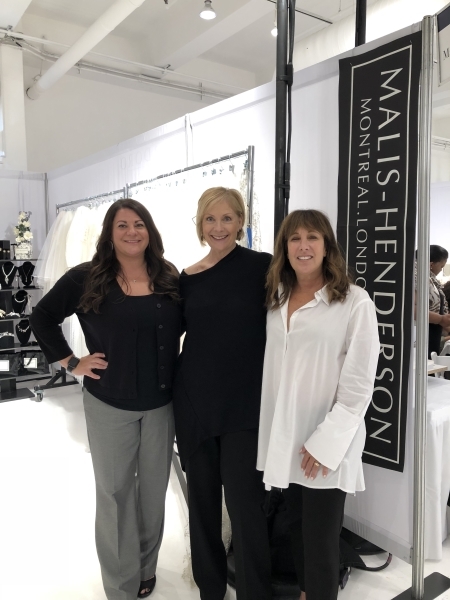 A Fabulous New York International Bridal Week! 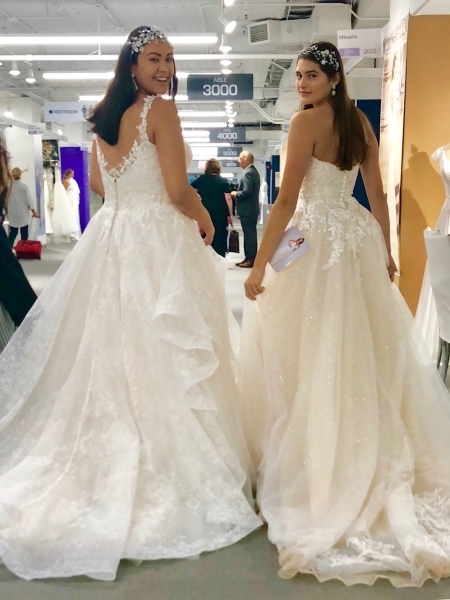 Just back from The New York International Bridal Week, and how great it was to see new and long time customers, friends in the industry, and the all the organizers who did a great job in keeping everything running well. Here are three of our styles that drew the breath from the audience at the fashion show. For our showstopper in both Chicago and New York, Elen created this magnificent one-of-a-kind veil with champagne petals and clear diamantes. Needless to say the crowd was wowed and the cheers were loud! 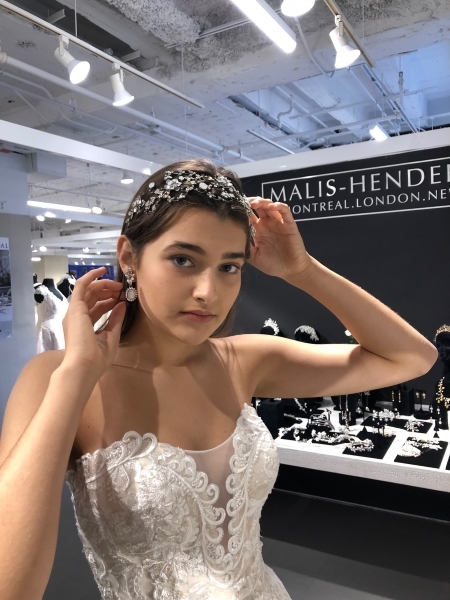 What a wonderful experience it was to participate in Kleinfeld Canada's Premiere Accessory Week in Toronto. I was impressed watching the consultants working with their brides demonstrating their knowledge and expertise. And the store you ask? ABSOLUTELY BEAUTIFUL! 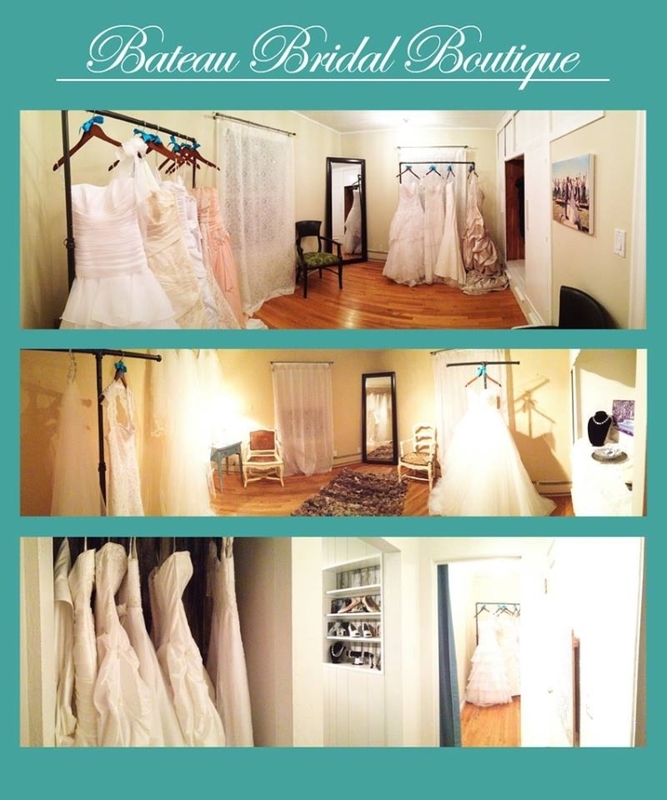 - BRIDAL HEAVEN. Looking forward to seeing everyone at the Chicago and New York Bridal Markets ! On the catwalks in London and New York, it is clear that long veils are making a strong comeback. What is more romantic and beautiful than the vision of a bride making her entrance, enveloped in the soft flow of an illusion or faux-silk veil? 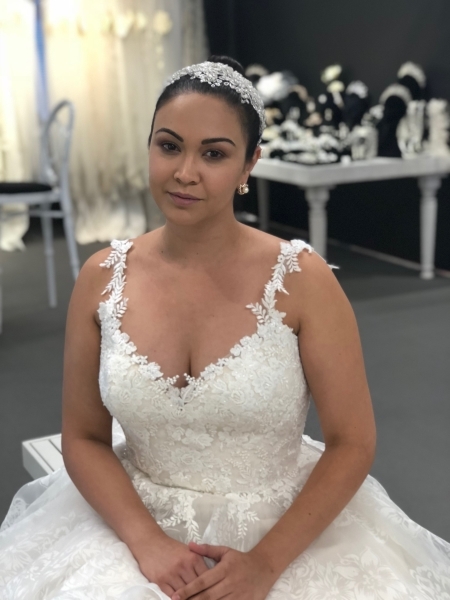 Our 2014 Collection (sneak a peek at the “Garden Veil”) will feature stunning Alençon laces with hints of gold or silver, delicate Chantilly laces, pearls and diamanté detailing on long veils that will embrace the bride’s gown and create that magical look. Brandi's Bridal Galleria will be showing some fabulous Malis-Henderson headpieces and veils at the Wedding Planner & Guide Winter Bridal Show to be held January 11 and 12, 2014 at the Alliant Energy Center Exhibition Hall in Madison, WI. The Fashion Show takes place at noon and at 3:00 PM each day. Tickets can be purchased in advance at Brandi's Bridal Galleria, at www.wedplan.com, or at the Alliant Energy Center on the day of each show. Come back to the blog after the event when we will have some pics for you to view. 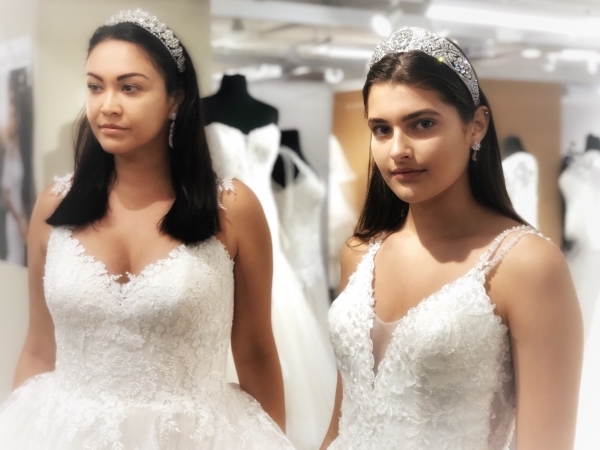 Malis-Henderson is thrilled to welcome it's most northern authorized bridal boutique in the world with the addition of Bateau Bridal Boutique in Anchorage Alaska. 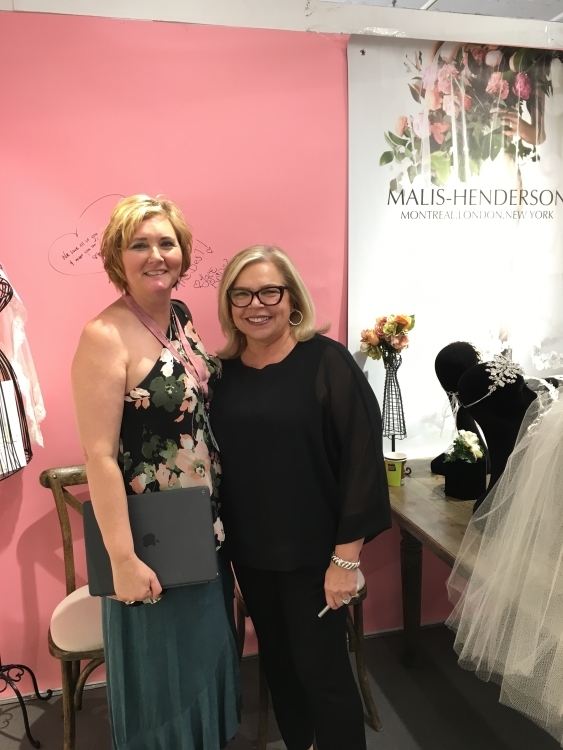 Owners Tara and Elizabeth are known for their personal service and their wealth of expertise in making sure that every bride finds the dress and accessories to create that individual and special look they've always dreamed of. At Bateau the bride is not just a client, she is a friend.